Feyenoord has to deal with the threat of Alkmaar in their pursuit for the direct-promotion spot to the Europa. The former has a lead of just one point over the other while taking on another playoff hopeful, whereas, Alkmaar has been dealt with a much easier opponent. With five match-days remaining in the league, it’s crunch time, and every game counts. Groningen and Willem, currently just below the playoff zone, have been pulling in great performances and is rightfully threatening Vitesse and Heracles for their respective positions in the league. 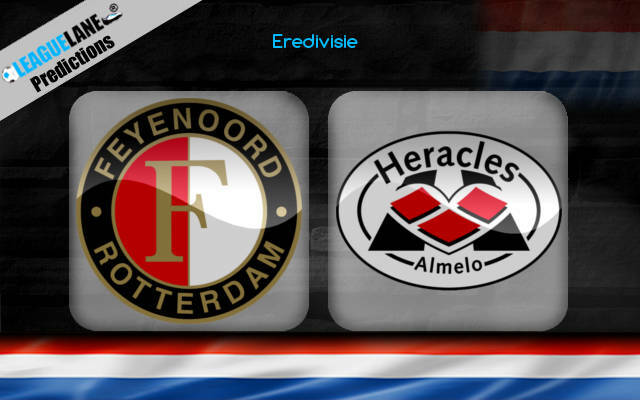 On top of that, Heracles has to take on Feyenoord on the road this weekend, which puts them in a bothersome situation. Feyenoord won the last six games in a row. 15 of the last 17 wins belong to Feyenoord. 11 of the last 12 wins at this venue went to the hosts. Ten of the last fourteen encounters at this stadium saw the home team scoring two or more goals. Feyenoord is forced to act. They were lucky to get back possession of their coveted third spot in the table, which would give them a chance to make an entry into the Europa, without the formality of the playoffs. But since AZ is just a point below, and is taking on a far easier customer, the hosts need this win. H2h games comfortably gift them the favorites tag. The team won the last six matches in a row and registered 15 of the last 17 wins. Moreover, only once has Heracles recorded a win at this stadium, and the combined scoreline for the last 14 encounters here is 43-10, in favor of the hosts. Going on, Heracles was winless in ten of their last thirteen trips on the road, whereas Feyenoord won 17 of their last 21 home ties. Count on them to deliver in this high-pressure tie. EH: -1 for Feyenoord; Feyenoord to Win @ 1.60 (3/5).